Many pets that are diagnosed with cancer can have an improved quality of life with the addition of veterinary chemotherapy agents to their treatment plan. Not all forms of cancer will respond well to chemotherapy, but our specialists and nursing team can help you make the decision to treat if it is best for your pet. Our goal is to improve the quality of your pet’s life. When we recommend chemotherapy, it is because we believe that the benefits of chemotherapy outweigh the potential complications for your pet. We provide a dedicated nursing staff for our chemotherapy patients who provide constant support to help you with questions and concerns. Pet cancer diagnosis and management is something we specialize in here at Southern Colorado Veterinary Internal Medicine. Both dogs and cats can be affected by cancer. As is the case in humans, cancer can affect any organ within the body. There are many options to address the problem of cancer in pets. These options include surgery, chemotherapy, and radiation therapy. In some cases, multiple modalities may be employed to treat your pet. We specialize in the planning and administering of various chemotherapeutic medications to help fight cancer. If radiation therapy is the best option to treat your pet, we may recommend a referral to another facility. 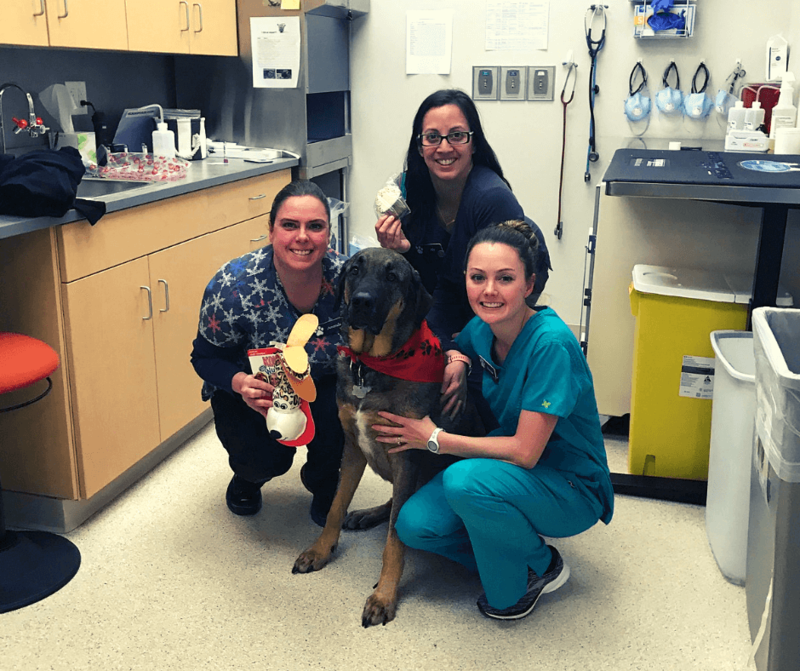 “Yogi” and his oncology team celebrated his final chemotherapy treatment for lymphoma in January 2019. WHAT IS CHEMOTHERAPY AND WHY WOULD MY DOG OR CAT NEED IT? Chemotherapy is a term given to a group of drugs that have the ability to kill cancer cells in dogs and cats. The specific medication or combination will depend on the type of cancer your pet has, as well as his or her overall health. Your veterinarian will monitor the chemotherapy treatment to ensure that it is working well with minimal side effects. If not, he or she might try another drug or change the dosage and frequency. WILL MY PET LOSE THEIR FUR? Most pets do not lost their fur while undergoing chemotherapy, because their coat is not continually growing. That said, there are some breeds of dogs (like Poodles) whose hair does grow continually, and those dogs can experience hair thinning or patchy baldness from chemo treatments. WHAT ARE THE SIDE EFFECTS OF CHEMOTHERAPY FOR PETS? Side effects for dogs are milder and generally last for a shorter period of time than for humans receiving chemotherapy because dogs are given less-aggressive treatment. In fact, 75 to 80 percent of dogs have no side effects. When present, typical side effects include loss of appetite, vomiting and diarrhea. Less than five percent will suffer those effects more severely and will need to be brought into the vet to receive fluids. 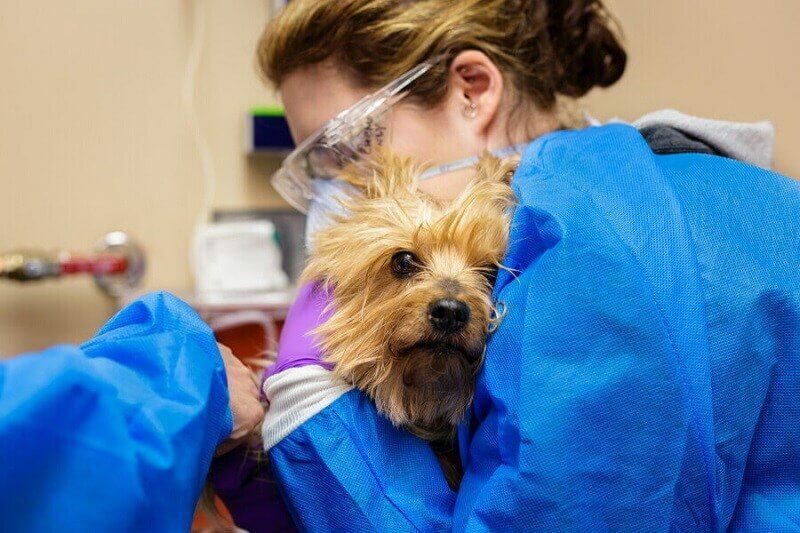 Our goal of chemotherapy in pets with cancer is to preserve the highest quality of life possible. HOW IS CHEMOTHERAPY GIVEN TO PETS? Chemotherapy treatments for dogs and cats may be given orally or by injection. The protocol of drugs to be given in regular intervals is called a cycle; your veterinary specialist will specify how the drugs are to be administered and at what days when the protocol to you. The number of chemotherapy cycles a pet receives may be somewhat flexible, depending on the tumor’s response to the drugs. HOW OFTEN WILL MY PET NEED CHEMOTHERAPY? Frequency of treatments will depend on your pet’s type of cancer, their overall health, the specific drug, and of course, your family’s wishes. Most dog and cat chemotherapy treatments are given in intervals ranging from once a week to once every three weeks. The duration of the treatment is also dependent on the type of cancer your pet has, and can last from a few months to a few years. For lymphoma, most standard chemotherapy protocols last between 16 and 24 weeks. Remission does NOT mean that the cancer is gone. It simply means that all clinical signs of the cancer are gone. For example, if your pet has lymphoma, complete remission is achieved when your veterinarian no longer finds enlarged lymph nodes in their body. Dogs and cats today have a better chance of being successfully treated for cancer than they did ten years ago! The more we learn about canine and feline cancers, the more pets’ lives we can improve and save. MY PET WAS DIAGNOSED WITH CANCER. NOW WHAT? Take a deep breath. Meet with your family veterinarian to discuss treatment options as they can likely provide the best initial treatment plan. Then, a consult with a specialist should be considered to discuss all of the different treatment plans and decide as a family what the best options are.